The tastes are sweet, sour, spicy, sharp and mild. Only in Asia can cuisine be a little of everything. A little of just what you want it to be. Thai Thai Restaurant on Highway 58 in downtown Naha is a little of everything, and a lot of it too. The sign sums it up; Exotic Asian Dining. 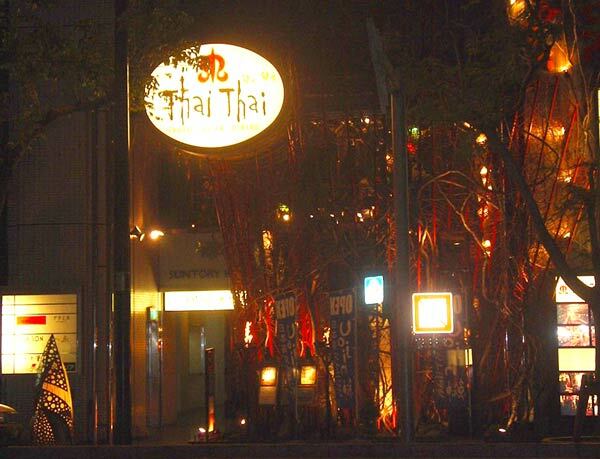 At first glance, looking at Thai Thai from the street, the impression is of a classy, upscale Thai restaurant. The signage, symbology, lighting and use of plants convey the Thai image. Upon entering the second floor eatery, though, amazement begins. The interior décor is modernistic, albeit Asian. The “trouble” is, it’s not really Thai. Asian, yes. Beautiful, yes. A unique experience, absolutely. Patrons are seated in a variety of nooks and crannies, or in several overhead tubes which afford individual group privacy, and a sense of…well, something unique. The menu? Ahhhh. Something else to behold. Exotic Asian dining. A menu that encompasses the cuisines of Thailand, Malaysia, Singapore, Indonesia, and a bit more. Add in a bit of Chinese and Japanese, and you’ve got Thai Thai. Impossible to describe, other than to suggest there’s not a bad dish on the menu. Or on the daily specials either, for that matter. Several of the menus have a bit of English, while others require the help of the waitstaff to sort things out. Meal items are served much the izakaya style, with smaller portions designed for 1-2 people. It takes 3-4 items to satisfy the palates of the average couple. Fish, pork, beef and poultry are all a part of the evening fare. Prices are very reasonable, with a full round of 4-5 dishes plus a few beers to wash things down with, for about ¥5,000. Individual choices may vary. The beverages are ample as well, with traditional soft drinks, tea and of course, beer, sake and awamori to enliven the adventure. We didn’t have reservations on our visits, but they were on weeknights. Recommend you call ahead on Friday and Saturday evenings. Thai Thai is easy to find. Drive south on Highway 58 into downtown Naha. As you approach the Matsuyama Crossing intersection, begin looking to your right. Easy to see with its distinct sign and lighting, just before the crossing. Once it’s in your sights, look for parking lots with the big blue “P”. There are many around the area, with prices averaging ¥300 per hour.